This Magdalen of the Franciscan Order, Saint Margaret of Cortona, came into the world in the year 1247 at Laviano near Cortona in the province of Tuscany. When Saint Margaret of Cortona was 7 years old, she lost her pious mother. She was neglected by her careless father, who married again within a short time, and her unsympathetic stepmother dealt harshly with her, so that when Margaret was 18 years old, she left home to earn her bread among strangers. Saint Margaret of Cortona was possessed of rare beauty, and ere long this became a snare for her. For the space of 9 years she gave herself up to a life of sin and scandal. Then one day she waited a long time in vain for her accomplice in sin to return home to the place where she lived with him. Presently his dog came to her whining and tugging at her dress. She followed the animal into the heart of the forest, and there she suddenly stood before the blood stained corpse of the unfortunate man; his enemies had murdered him. At the appalling sight, Margaret of Cortona was stunned like one struck by lightning. Filled with terror she asked herself, "Where is his soul now?" Then and there she firmly resolved in future to be even greater in penance than she had been in sin. Like the prodigal son she returned repentant to her native town of Laviano. In a penitential garb, her hair cut short, a cord around her neck, she knelt at the door of the church and publicly asked all the congregation to forgive the scandal she had given. Many people were edified at this public humiliation, but her stepmother was all the more embittered at it. She, as well as Margaret's father, forbade her to enter their home again. This reception severely tempted Margaret to return to the road of vice, but God's grace sustained her. Led by divine grace, she repaired to Cortona, made a contrite general confession to a Franciscan there, and submitted to the spiritual direction of her confessor. In a poor little hovel she now lived a secluded life, in penance, tears, and prayer, earning her scanty nourishment by hard manual labor. 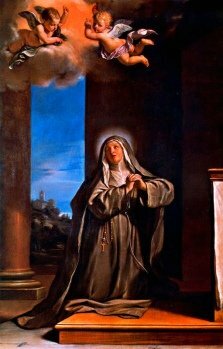 Again and again Saint Margaret of Cortona begged for the habit of the Third Order, that she might be recognized by all the world as a penitent. But not until 3 years had elapsed and she had been severely tried, was her wish granted. She received the habit in 1277. Now her fervor increased, and it is almost incredible what rigorous penances she practiced from then on. Day and night she wept over her sins, and often sobs so choked her voice that she could not speak. Satan made use of every wile and snare to cause Margaret to relapse, but prayer, mortification, and humiliation successfully put him to flight. When finally, after uninterrupted struggling, she had triumphed over every earthly inclination, God assured her that her sins were fully pardoned and granted her special proofs of His knowledge of the innermost secrets of hearts. In many an instance, even when people came from great distances, she recalled grievous sins to their mind, while her exhortations and prayers were instrumental in bringing about conversion. Many souls were released from purgatory upon her prayers. Almighty God wrought many miracles through her even in her lifetime. Health was restored to the sick, a dead boy was raised to life, and at her approach evil spirits shuddered and left those whom they possessed. Finally, after 23 years of rigorous penance, in the 50th year of her life, God called the great penitent to the Beatific Vision on February 22, 1297. 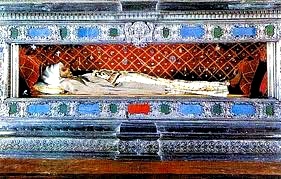 Her body is preserved in a precious shrine in the Franciscan church at Cortona which bears her name. It is incorrupt even at the present day and frequently emits a pleasant perfume. Several popes have confirmed the public veneration accorded her. Pope Benedict XIII canonized her amid great solemnity in 1728.